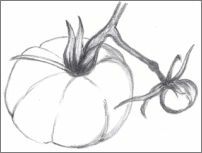 Adding light and shade to a drawing helps you obtain the true expression of any object. It is better than an outline because the shadow on any object varies with the form of the object and therefore describes it more expressively. If you study and master outline drawing, you can improve gradually by beginning to add light touches suggesting the most important features. Keep changing these slight strokes without erasing, until you feel you finally get the form correct. or of a room with shaded windows, or of a starlight night. The direct light may come from one or several sources. All of these variables come into play when you are fiddling with light and shadow. The main objective for any artist is to learn to see the form, light, shade and color effects of any object. If you wish, you can still simplify a subject and leave out the detail seen in light and shadow. Natural drawings are very attractive in raw form. In this drawing, I shaded the inside of the box, under the darker edge, but it hasn't scanned well enough to show that. I draw lightly so I have to pay attention to making darks in any image dark enough to form a good contrast. It's only a matter of careful study and practice that will lead you along the path to successful drawing with light and shade. Once you get there, you will notice that you are more capable of expressing yourself artistically. When you draw, you only need to produce or depict the strongest impression that this subject has on you. The transition from outlines to light and shade will become a natural process. The touches required to obtain the form will often blend together and suggest the light and shade effects of the object. Outline study leads to that of values. A natural continuation for beginner artists is to make a shaded drawing without the use of a background, as in the drawing below of an old wood stool. The trial lines (lines that you add as you're copying the object) should follow the surface that they represent and give the effect of shade. These shade strokes help give character to the object. You can then darken the shadows, add accents and finish the drawing. This natural process of making a light and shade drawing is the same process that the most famous artists practiced in the past. You can make a distinct change to a simple outline drawing just by representing the shadows. You can suggest wider shadows around an object by thickening the outline - this is called an accented outline drawing. 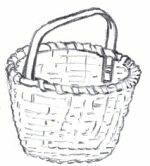 The basket is an example of an accented outline drawing. It looks a bit more interesting than a uniform outline. It's not a very good drawing on my behalf, but I hope you can see what I mean. I started this drawing by initially sketching in the oval shape of the lip of the basket and building from there. With this shoe drawing, you can see the shadow upon the heel. This gives the contrast of the masses of light, shadow and cast shadow. Shadows and cast shadows produce a stronger impression of nature, something that can't be obtained from an outline. Whenever a cast shadow of an object is shown, the shadow surface adjoining the cast shadow should be represented too. So, do you see the right side of the box is shaded? That is called the shadow surface. Also, do you see the shadow of the box upon the surface where it sits? That is called the cast shadow. Without light, there is no shade. You can use any kind of lines to depict light and shade because as the artist, you are the creator! Did you know you gain a lot of insights just by signing up for my newsletter?